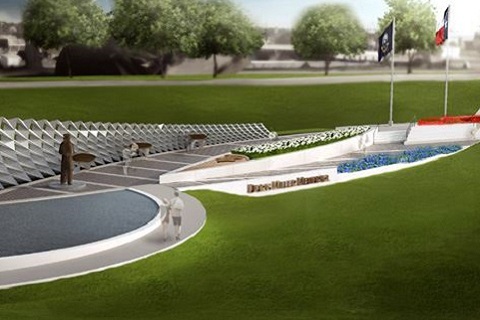 Flag raising at the memorial will be today, Thursday, December 6, at 3 pm. The dedication ceremony is planned as scheduled. On December 7, 1941, Mess Attendant Second Class Doris Miller, a Waco native, was collecting soiled laundry just before 8:00 A.M. When the first bombs blasted his ship at anchor in Pearl Harbor, Miller went to the main deck where he assisted in moving the mortally wounded captain. He then raced to an unattended deck gun and fired at the attacking planes until forced to abandon ship. It was Miller’s first experience firing such a weapon because black sailors serving in the segregated steward’s branch of the navy were not given the gunnery training received by white sailors. Although news stories have credited Miller with downing from two to five airplanes, these accounts have never been verified and are almost certainly apocryphal. Miller himself told Navy officials he thought he hit one of the planes. Navy officials conferred the Navy Cross upon Miller on May 27, 1942, in a ceremony at Pearl Harbor.